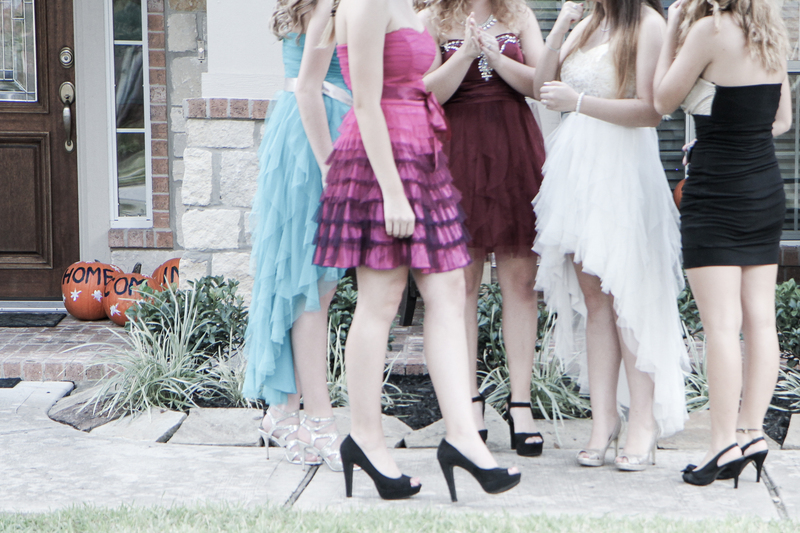 This past Saturday was Kingwood High School’s homecoming dance, and so this photograph that I took seemed perfect to portray a ‘gathering’ for week 41 of our blog. In the pretty tiered pink/purple dress in the foreground, wearing gravity defying heels that, as her mother, I’m stunned that she can walk in, is my 16 year old daughter Ella. Apparently all shoes are quickly discarded at the dance, which I was pretty glad to hear as I’m sure there would otherwise be quite a few fashion sustained injuries. The actual focal point of the picture is the set of three pumpkins in front of the doorway, which I had decorated earlier that day. I did quite a lot of playing around in Lightroom 4 with the image in post processing, as I wanted to desaturate the bold colors, and try to give a more ethereal, timeless quality to the photograph. This picture was taken at around 6 o’clock in the evening, using my Canon DSLR paired with my 17-55mm f/2.8 lens. My settings were ISO 400, shutter speed 1/160, and aperture f/3.5. I focused on the pumpkins next to the door and recomposed the shot, so the pumpkins are sharp and the dresses are slightly soft and out of focus. Post processing in Lightroom 4, I initially cropped the image, increased the temperature and decreased the tint, increased the exposure and contrast, but decreased the saturation and vibrance. I decreased the black and white clipping, then finally adjusted individually the blue, magenta, purple, and orange luminance and saturation. Another autumn treat, ‘gathering’ walnuts. We actually have a beautiful black walnut tree in our yard, but these pictured above are English walnuts. 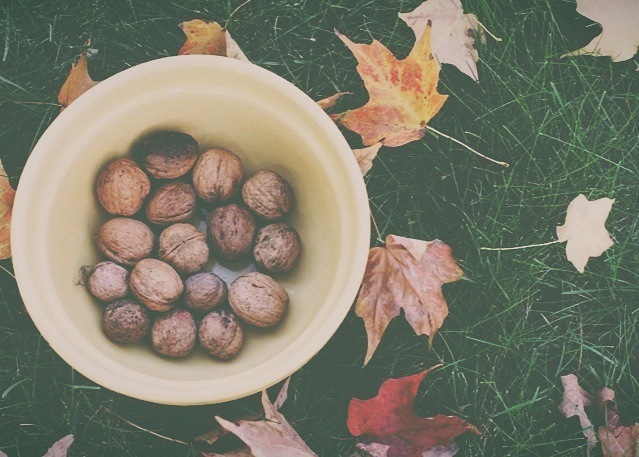 The nuts grow in shells that are about the size of baseballs, and when they are ready to harvest, the outer layer will begin to crack and often fall from the tree. Shucking a walnut is a bit of a process, but for both the taste and nutrition, it is definitely worth the time. I took this photo with my iphone on another picture perfect fall day. The sun was strong and the bowl was shaded by our maple tree. I started the edit in VSCO app where I faded the overall photo, increased the fill, increased the vignette and slightly increased the saturation. I then cropped and lightly sharpened in Snapseed. Love the perspective on both pics! !